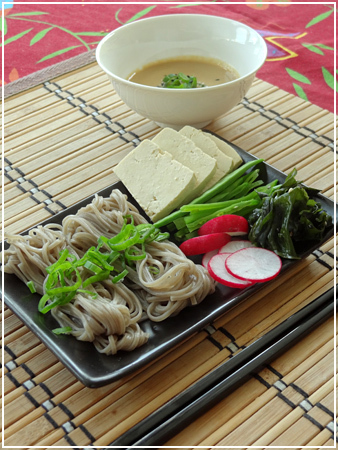 Cold Soba (Buckwheat noodles) are a traditional Japanese summer dish. I replaced the traditional soy-and-vinegar dipping sauce with a sesame sauce I tried last year in Singapore though, and added a bunch of fresh vegetables to be dipped alongside the noodles. For the sauce I used Tahini, which is basically just ground sesame seeds, as a base. It’s not technically Japanese but it makes working with the sauce a lot easier. Optional: Some ground chili or Szechuan pepper. Mix ingredients thoroughly, serve chilled. Serve with soba, chopped spring onions, and whatever other veggies you like. I had tofu, sliced radishes, sliced sugar snaps and some wakame salad on the side. Yum! Back from summer break with this fresh salad bento! 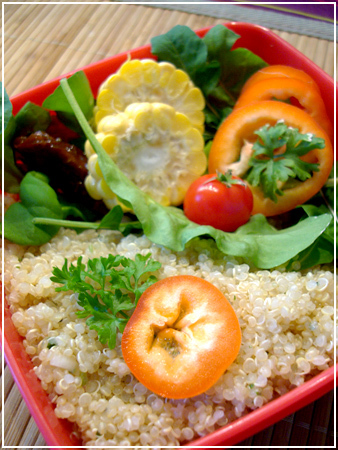 Quinoa marinated with basil oil, vinegar and onions, homegrown rucola, a sundried tomato, homegrown bell pepper and cherry tomato, and corn-on-the-cob flowers. Parsley decoration. 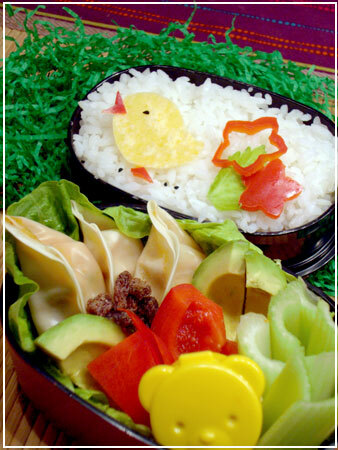 A little spring-themed bento – still no sign of spring here, sigh! Dumplings, avocado, more bell pepper, celery, a bear cup with peanut butter and raisins for the celery. 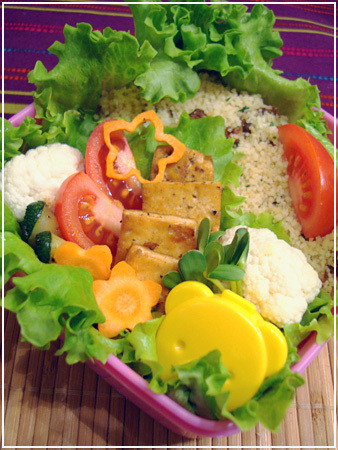 Couscous with sundried tomatos and parsley on lettuce, cauliflower, tomato wedges, marinated and fried tofu and zucchini, carrot flowers, sunflower sprouts and ajvar in the bear cup. Christmas candy #2: Ice chocolate! Need a last-minute gift to bring to your Christmas party? 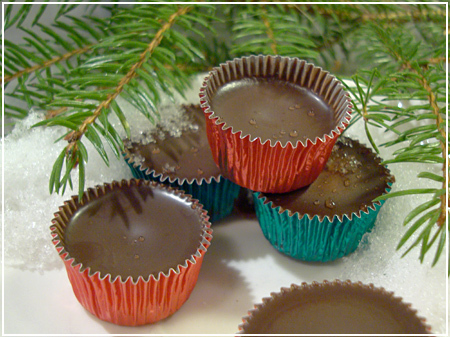 These homemade chocolates take almost no time at all. 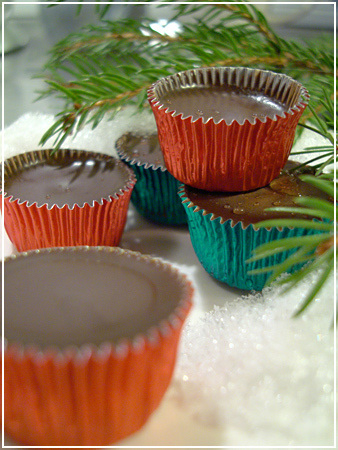 I put my foot down on using my grandma’s recipe though – I was NOT going to make it with pre-made cooking chocolate. Nope, nothing but cocoa, sugar and cocos fat in this one. Snow! Or alternatively, space in the freezer. Melt the cocos fat over a water bath. It only needs about 70 degrees Celsius to melt, so it’ll melt quickly. Stir in the sifted sugar and cocoa powder. Stir well! Pour into the forms and put the forms out in the snow immediately. When the chocolate has hardened, stack in a jar (if using disposable forms) or (if not) remove the chocolate from the forms, stack it and pour more! Store in a jar in the fridge. The cocos fat makes the chocolate very soft, but also cool in your mouth. Be quick or it’ll be gone before you know it! I’m really really sorry. I was aiming for cute animals. But I’m apparently just not a cute person. And my creative brain knows how to grab on to a good visual pun and run with it. I don’t even listen to KISS. Anyway. 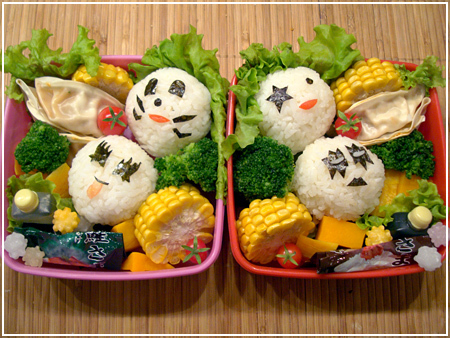 KISS onigiri on lettuce, corncob flowers, veggie dumplings, broccoli, cherry tomatoes, steamed butternut squash, bottle of soy, packet of furikake and some Japanese star candy (konpeitou) as dessert. I happened upon a real Farmer’s Market in town today – a proper market with stands that is, with guaranteed real and local farmers. As a bonus, most of them were certified organic. So who can blame me for not being able to resist? 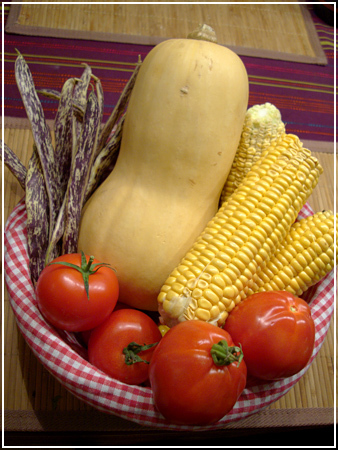 The corn was our dinner today. And the flat green beans and tomatoes are a special bonus – they’re not only organic, but Demeter-type biodynamic. I’ve bought the tomatoes before – they’re just heaven in round, red shape. So curious about those beans though! I’ll definitely write a review when I cook them. Aren’t the purple freckles just lovely?